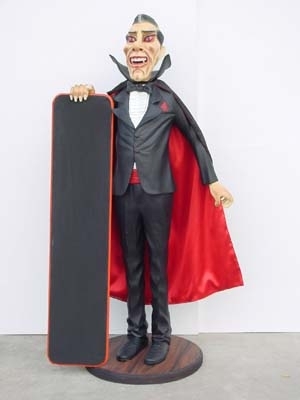 This fabulous figure of the vampire Count Dracula holding a menu black-board is great for promoting horror nights and themed parties. This statue of the infamous vampire Count Dracula is one of our fantastic Horror themed models. Ideal for using in any spooky setting this figure hold a black-board for promoting your menu or Halloween events. The model has a black silk cape and is dressed in an elegant evening suit.